VANCOUVER, May 8, 2014 — Housing starts in the Vancouver Census Metropolitan Area (CMA) were trending at 18,682 units in April compared to 18,729 in March, according to Canada Mortgage and Housing Corporation (CMHC). The trend is a six-month moving average of the monthly seasonally adjusted annual rates (SAAR)1 of housing starts. “The trend was relatively stable in April, with a marginal increase in single-detached home starts balanced by a small decline in multiple-family construction,” said Robyn Adamache, CMHC’s Senior Market Analyst for Vancouver. *Seasonally adjusted annual rate. Source: SCHL. The standalone monthly SAAR was 17,681 units in April, down from 20,594 in March. This decrease is the result of a decline in multiple housing starts, notably in apartment construction. 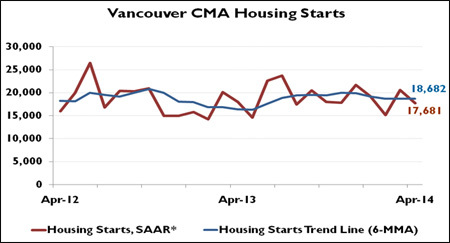 Housing starts in the Abbotsford-Mission CMA were trending at 629 units in April from 463 units in March. For more information, contact me at bob@bobsethi.com with subject line, "CMHC". All information taken from sources believed to be reliable. Reproduced from CMHC news release. 1 All starts figures in this release, other than actual starts and the trend estimate, are seasonally adjusted annual rates (SAAR) — that is, monthly figures adjusted to remove normal seasonal variation and multiplied by 12 to reflect annual levels. By removing seasonal ups and downs, seasonal adjustment allows for a comparison from one season to the next and from one month to the next. Reporting monthly figures at annual rates indicates the annual level of starts that would be obtained if the monthly pace was maintained for 12 months. This facilitates comparison of the current pace of activity to annual forecasts as well as to historical annual levels.